Nicky strives to be the best in all that she does! "The experience has been perfect in every way"
The experience of purchasing our new home has been perfect in every way, thanks to you. Your web site was easy to use and certainly covered the real estate market in Northwest Arkansas. With short notice, you worked us into your schedule at our convenience. You made us feel comfortable from the start. Was it your willingness, your listening ability, your knowledge of real estate in Northwest Arkansas? It was all of those qualities. We feel like we were able to acquire the perfect house for us and that we have a new lifetime friendship with you. Thank you is inadequate - but will have to do for now - to show our deep appreciation for your help and guidance with our new Deer Haven home. We highly recommend you to anyone in the market for a home. "She is the most calm, sweetest and honest people"
"NICKY DOU has a wealth of information"
"She gives a good name to the business"
"Passionate Realtor in Northwest Arkansas"
"Nicky was, by far, the most professional agent "
"Nicky made us feel like we were a top priority!" "Jeremy and I couldn't be happier in our new home, and we owe it all to you. While we know you were swamped, you always made us feel like we were a top priority. Your personal attention to our selling/buying won't be forgotten! 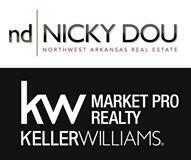 "Nicky is one of the best Realtors I know"
"Nicky Dou is the best." 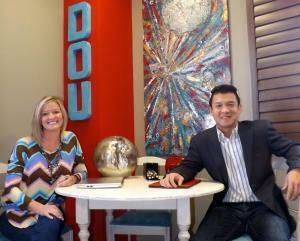 "I highly recommend Nicky Dou"
"Nicky Dou is simply--The Best!" Thank you for your direction, assistance and overall concern for our real estate needs. Your market knowledge, energy, persistence and dedication made a huge difference in arriving at a home decision. The professionalism you exhibited has unfortunately become a rarity in American business! More importantly, your personal attributes enabled you to demonstrate your skills in a wonderful, congenial way. From the beginning of our relationship, you made us feel like a member of your family, your close circle of friends. You could only achieve that if you are a genuinely nice person. We would recommend anyone to avail themselves of your services, regardless in what capacity. You are simply—The Best! "I always recommend Nicky Dou"
"Her performance in successfully selling our home"
"I wanted to let people know how pleased we were with Nicky's performance in successfully selling our home on Lakefront Drive in Fayetteville. She helped navigate us through quite a bit of adversity to bring both parties to closing on an exceptional offer and better-than-expected timeline. Her professionalism, salesmanship, and marketing ideas were exemplary, and we will be recommending her to my friends and business contacts."